September 10, 3:00 p.m. – 7:00 p.m.
September 1, 10:30 a.m. – 1:00 p.m.
Venue: Happy Valley Temple, Hong Kong. At 4.50 am, on the Krishna Janmashtami day, the bhajan hall was echoing with the mantras of Lalita Sahasranama. The adjacent Kalari, filled with white smoke from the Homa Kunda. 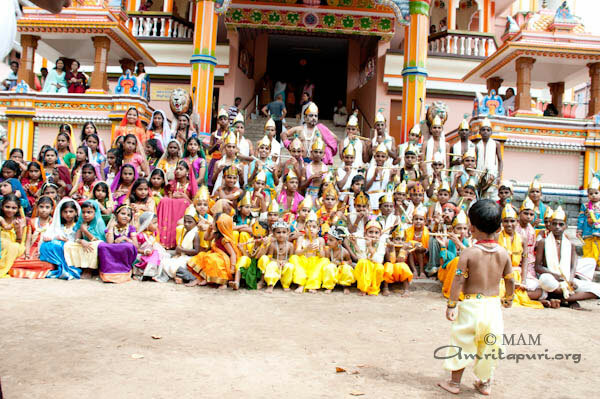 The celebrations of Lord Krishna’s birth had begun in the charged atmosphere of Amritapuri ashram. 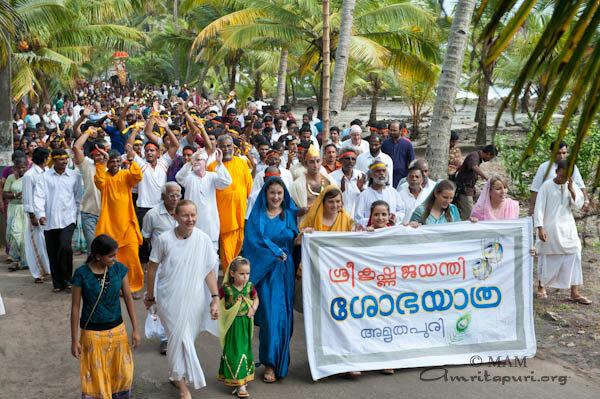 To celebrate Krishna Jayanti with Amma, devotees poured into Amritapuri from the different corners of India and abroad. Because it was Krishna Jayanti, there was a full day of activities planned: Amma came and gave Darshan to her children, till about 3.00 pm, then the Nagara Sankirtan procession started at 3.00, ending at about 4.00 pm, with hundreds of devotees, ashramites and dozens of young Krishnas and Radhas all dressed up to participate in the procession chanting with fervor the divine names of the Lord. 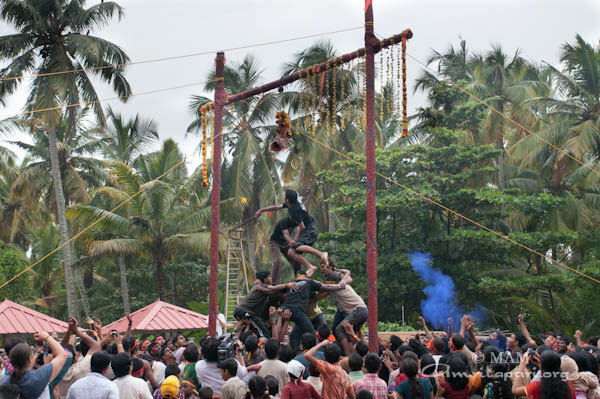 The open ground on the west side of the ashram was all set to host the anticipated “Uriyadi” (the traditional cowherds’ game of breaking curd-pots, reminiscent of Krishna’s childhood pranks of stealing butter and curd stored in pots hung from the ceilings of houses). Just as Amma came out heavy rain began to fall, but Amma wouldn’t let that dampen the spirit of the gathering, and spontaneously shifted the venue to the bhajan hall, with the main stage serving as the venue of Uriyadi. 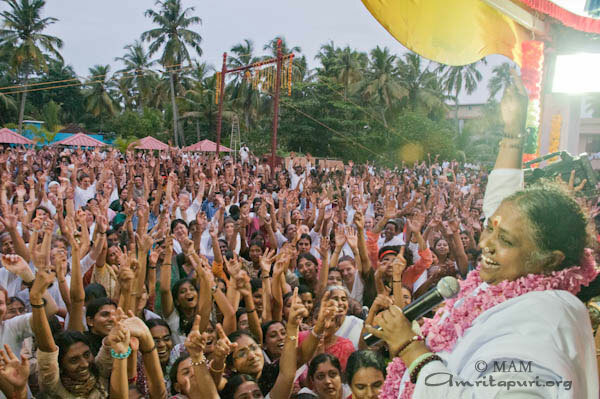 Amma sat on the stage was surrounded by countless little Krishnas with as many of as possible trying to occupying Amma’s lap. In between Amma’s concerned voice could be heard asking everyone to dry their heads from the rain, so they wouldn’t catch cold! And of course there was laughter all around when an infant Krishna in Amma’s arms, suddenly remembered its mother and started crying loudly. As the kids finished the “first stage” Uriyadi, and the rain had stopped, and Amma asked everyone to go back to the open grounds which was now totally muddy. 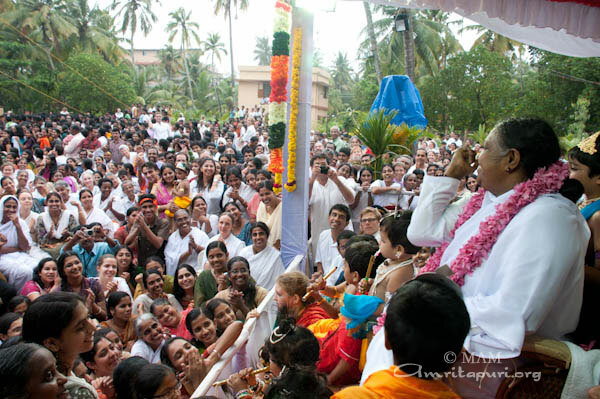 No one seemed to care as they stood in the mud, in puddles, on the available chairs and tables and some even in the trees; their eyes all riveted on Amma. 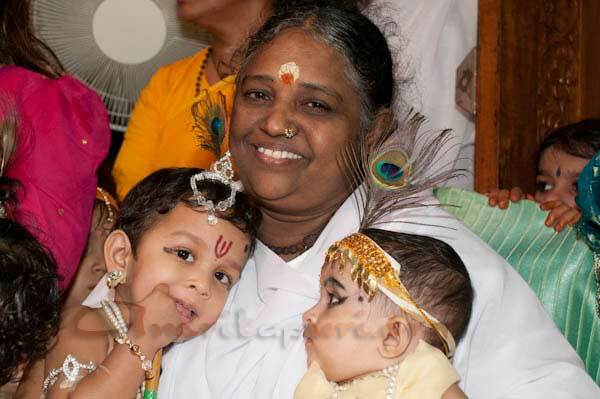 The grounds had become Vrindavan, full of fun, excitement, and enthusiastic bhajans all lead by Amma. After the Uriyadi, Amma, was back again for the regular evening bhajans which began with, “Hare Krishna shaure, vibho vishva murte, mukunda murare, yashoda ke pyare” in praise of child Krishna. But the final act was yet to come! 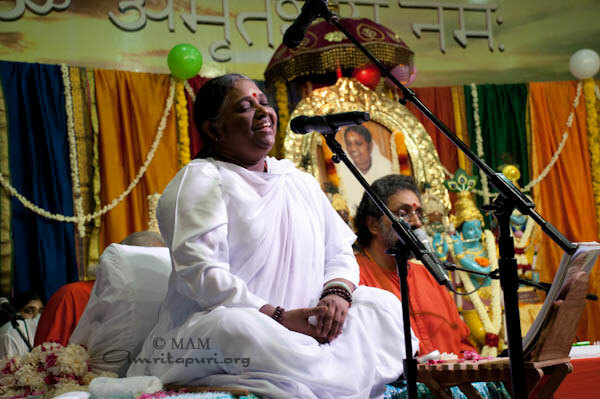 At about 11.30 at night, for the fourth time in the day, Amma, returned to the stage where the Bala Gopala Puja and the reading of the Srimad Bhagavatam were taking place. 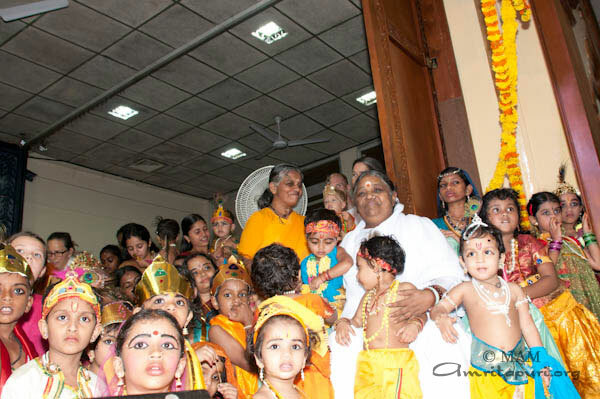 Then as she does for every Krishna Jayanti, in a very blissful mood Amma sang several Krishna bhajans and finally asked all the devotees to stand up, put aside all their inhibitions and worries, and forget everything, and dance in bliss and ecstasy. 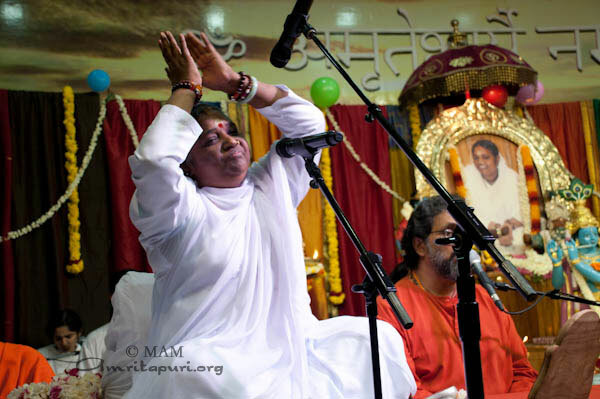 Amma then lead the bhajan ‘Hari Bol Hari Bol Hari Hari Bol,’ while the whole hall erupted in dance. 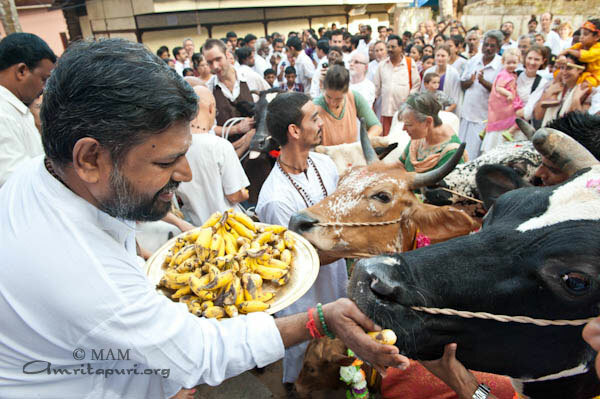 Then Amma distributed payasam to all the devotees. 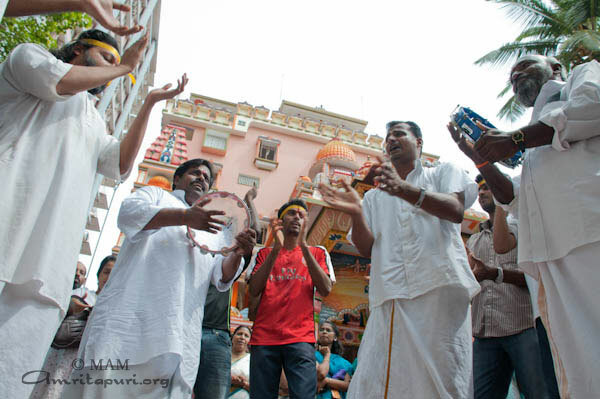 One could hear Amma repeatedly asking for devotees who hadn’t received the payasam to raise their hands. Only after making sure that every one of her children had received the payasam did she go back to her room. 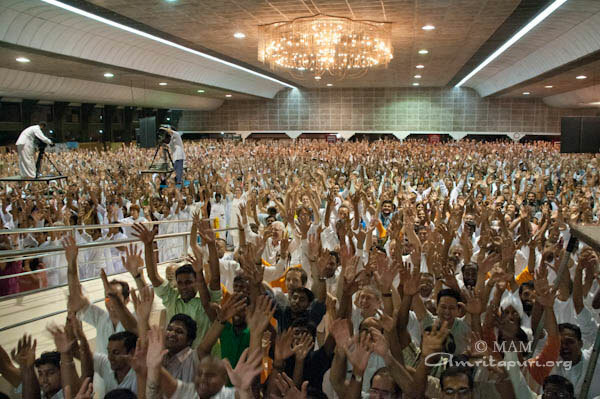 It was past 1.30am and another memorable moments were archived in the hearts of devotees. August 12-14, 2011 M.A. Center, Washington, DC. Under the guidance of Br. 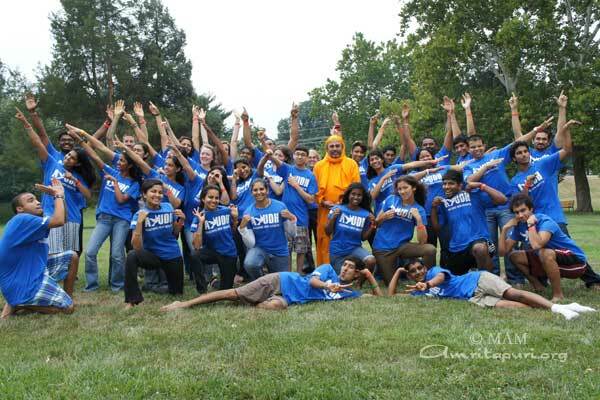 Dayamrita Chaitanya, forty youth came together for the second annual AYUDH East Coast Youth Exchange for the theme ‘Reaching New Heights’. The zealous youth from across the United States and Canada gathered at the picturesque ashram to share ideas, pray together, and join hands in performing selfless service. The participants arose early the first morning to cook and serve lunch for the Bethesda Cares shelter in Maryland. 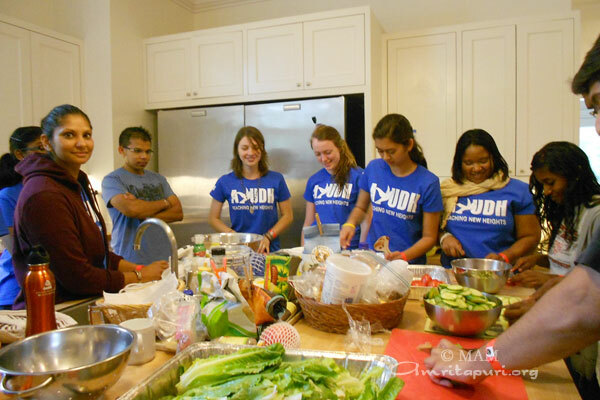 Apart from the joy of partaking in teamwork to churn out a meal within an hour, some participants remarked that it was their first time serving at a shelter, and it was a transformative experience. “It was eye-opening to see firsthand how others appreciated so dearly what many of us take for granted every day,” commented Amit Sookdeo. In a question-and-answer session with Br. Dayamrita, participants learned how to handle stress, especially with demanding academic curricula. One of the retreat’s highlights was the screening of Bag-It, a documentary highlighting the gross waste of plastic and the subsequent effects on our ecosystems. Inspired by AYUDH members’ service projects around the world, the Amrita University students’ efforts to clean roadside trash in India, and Amma’s message that “Nature is our Mother,” the participants each pledged to make one change in their lives. The pledges ranged from carrying reusable bags to the grocery store to growing plants in one’s backyard, stopping the personal purchase of plastic water bottles to serving at a homeless shelter twice a month, and even recommending a composting system for one’s college dining hall to wasting less water on a daily basis. “Even though we pledged to do simple things like grow plants in our house or be more conscious about the environment, these little actions will add up in the end and we will see genuine change,” said Jaya Vallis. The rain cleared up the evening, as AYUDH members swam in the Ashram’s pool, played tennis and basketball, enjoyed a slip-and-slide, and roasted marshmallows in a bonfire. The following day, participants were treated to a lively bhajan class on the song “Akhilandeshwari Ambe,” involving a conglomeration of instruments, music styles, a rap, and singing variations between boys and girls. AYUDH had a satsang with Swami Amritaswarupananda via webcast from Amritapuri, who gave the camp members a guide to reach new heights and embrace what he coined the Law of Grace. 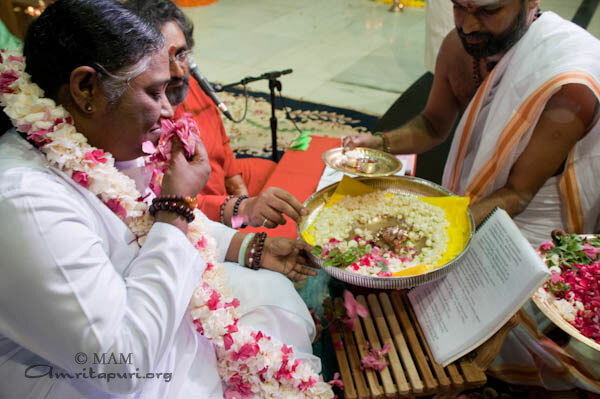 He also spoke of how love is a product of Amma’s grace, the elimination of emotional distress, and the three C’s: Calmness, Cheerfulness, and Confidence. 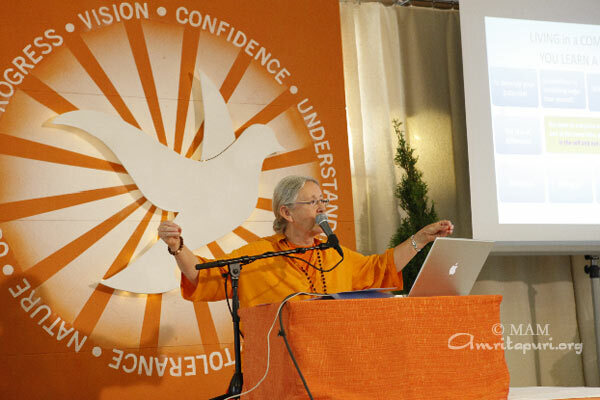 The final event of the retreat was one that had many participants fighting back tears. 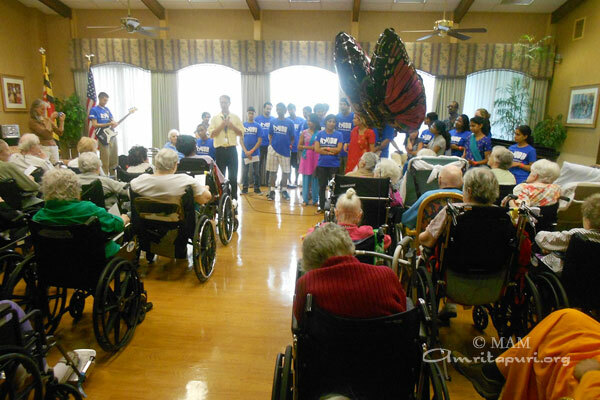 AYUDH had the opportunity to do a one-hour performance before the elderly residents of the Potomac Valley Nursing and Wellness Center. Titled “East Meets West,” the performance had a medley of songs and dances, such as “Leaving on a Jet Plane” by Hari Pancha, “Kal Ho Na Ho” by Amritesh Thoppil, “My Favorite Things” on saxophone by Karthik Krishnan, and a Wushu martial arts demonstration by Poorna Sreekumar. Several AYUDH members from DC choreographed and performed a fusion dance with raas, bhangra, Bollywood, and hip-hop, followed by an interactive “Lean on Me” led by Tom Marino for which all of AYUDH and many of the Center’s residents sang along. Throughout the entire set, several residents in the front row displayed their enthusiasm by clapping and laughing aloud at the jokes. The most memorable part was a spontaneous, heartwarming rendition of “Amazing Grace” by Fran, a care home resident who sung in her church choir from the age of two. Said Tom Marino, “This lesson was made tangible at our visit to the nursing home: At first I was nervous and doubtful. Through Grace, the three C’s gradually replaced my distress. The result was love, which had saturated the entire hall and is still present in my heart.” After spending some time with the residents who expressed their appreciation for the performance and after promising to come back soon, AYUDH members wheeled residents back to their rooms and returned to the DC Ashram, invigorated and touched by the bliss received in performing seva. 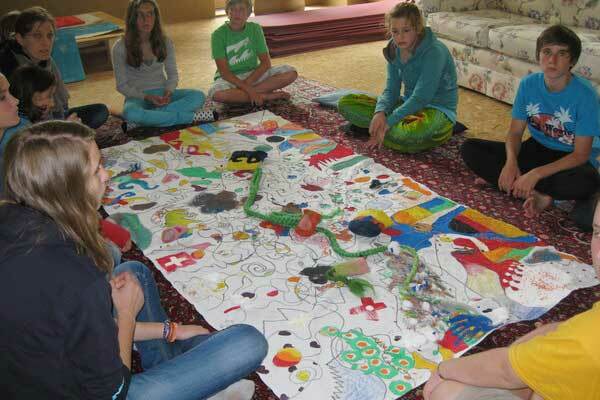 The first Teen-Retreat for children between the ages of 12-15 took place at the M.A. Center, Germany, on July 1.-3, 2011. The participants came to gel as a group through various team building activities such as group discussions, mural painting, music, etc. The mornings started with meditation. They were given the chance to express themselves creatively; they made their own picture-frames and paintings. The participants also came up with a new song which was tuned with the participation of all. This powerful song accompanied the entire retreat and brought out the strength and enthusiasm of the young group. On Saturday, the teens had a question and answer session over webcast with Br. Shubamrita. The teens also presented their song. Their honest and innocent questions were very interesting and thought provoking. Great was the enthusiasm for the Teen-Retreat. The teens left saying that they would want a longer camp next year! 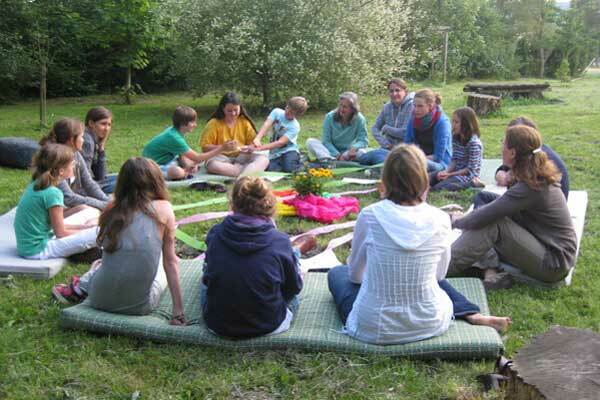 “In tune with nature” was the topic for this year’s Children Retreat on June 11th – 13th, 2011 during Pentecost. 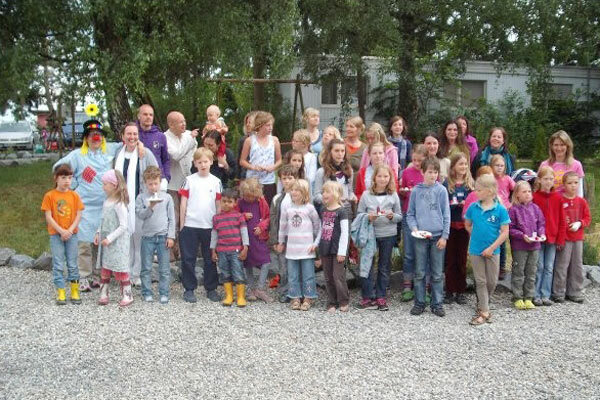 Forty children and their parents, from all over Switzerland and Germany, gathered together to spend an inspiring weekend at the MA Center Germany in Hof Herrenberg. Dodo, clown from the Children’s Retreat, led all into the fascinating subject of “sound”, showing us tricks and telling us about the sacred syllable OM. 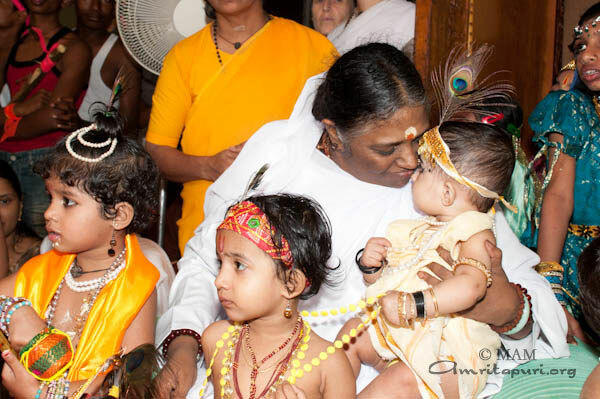 The children learned a song about nature “Mother Nature,” which Amma sang last year. In a playful and humorous way the children learned interesting things about the subject of sound, which was then discussed in depth in the afternoon in small group sessions. 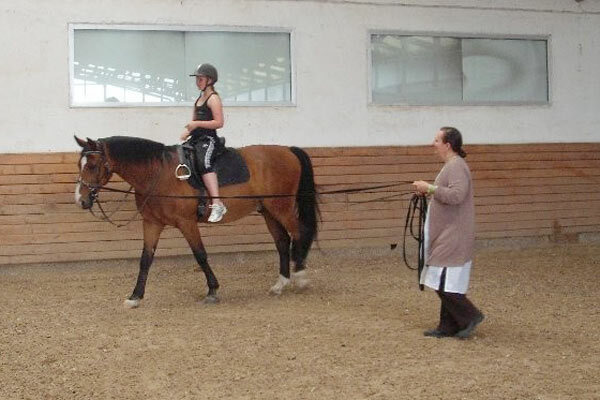 Humane values were taught during these sessions. The evening Bhajans were very touching. 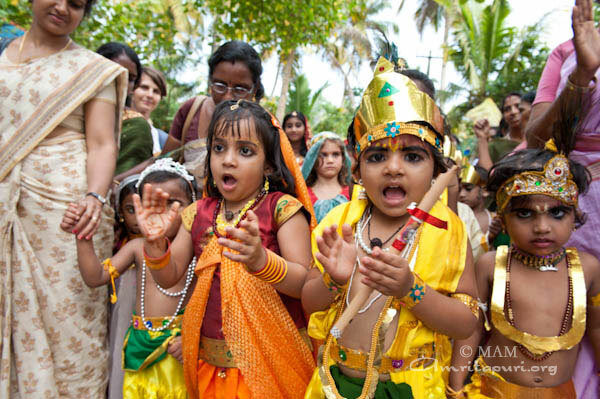 For many adults it was an impressive experience to see the children singing with so much joy and devotion. On Sunday, the children were asked to select one of the various workshops, which were part of the “In Tune with Nature” theme. 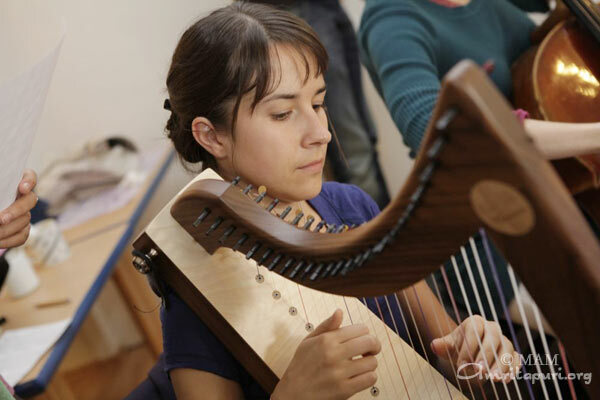 They could choose between; construction of their own instrument using materials from nature or developing a musical play about nature or working with horses in an appropriate, animal friendly way. 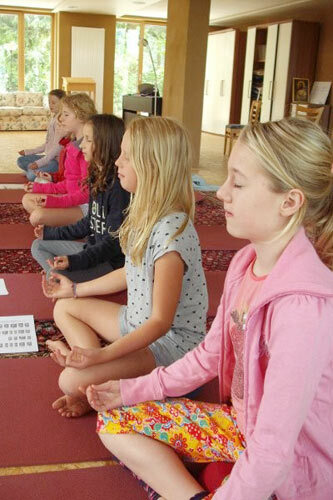 The children were also given a chance to learn the IAM-Technique for children. In the evening the children performed their musical play. On Monday, the children had the opportunity to ask Br. Shubamrita their own questions via webcast. They had endless questions about God and the world and Br. Shubamrita patiently took the time to answer them. On the last day, each child had the opportunity to make their own small Devi Bhava Amma doll out of felt. 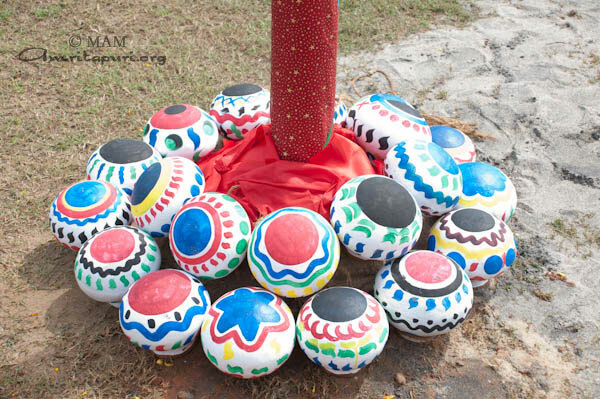 These dolls were used in the concluding ritual for a wonderful puja. Of course, Dodo the clown came again and presented each child with a small gift; a white rose and a delicious Swiss sweet called “Morachopf”, so they would remember this wonderful meeting. The retreat was indeed a true gift for the children and parents. They will certainly keep it in their hearts for a long time! 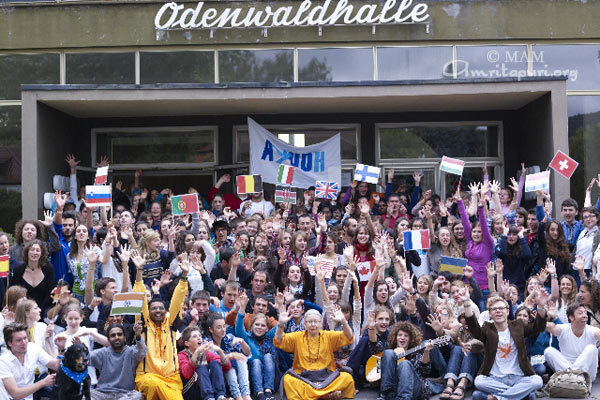 From 24 – 31 July 2011 the M.A Centre, Germany, hosted the 7th International Youth Initiative Reaching New Heights – The Power of Youth to Change the World, a multinational youth programme that welcomed 180 youth from 20 countries in Europe and beyond. Reaching New Heights focused on eight main challenges faced by youth in today’s society: lack of self-confidence, depression and suicide, addictions and substance abuse, erosion of culture and values, violence, poverty and unemployment, lack of perspective and meaning, family and social crises and environmental challenges. Each country group chose one specific challenge to deal with during the initiative. For six months prior to the camp, each country group chose one specific challenge to work with. Based on scientific research, discussions, and interviews with affected youth they produced a short video clip which was presented at the beginning of the camp. Four ‘Powers’ were then identified to deal with these problems: the power of confidence, the power of commitment, the power of creativity and the power of community. Tackling the eight challenges through these four powers thus leads to eight corresponding goals, referred to during the camp as the ‘Youth Development Goals’: Confidence, Understanding, Health, Tolerance, Nature, Culture, Progress, and Vision. The four powers were dealt with through talks and discussions during the camp. The power of confidence was discussed by Br. Shubamrita Chaitanya, who highlighted the importance of developing self-confidence as a tool for personal empowerment and suggested ways in which to achieve an increased sense of self-worth and integrity and ways to surmount obstacles in life. 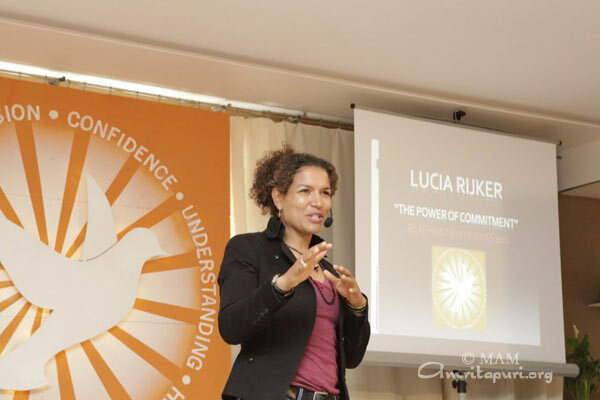 The power of commitment was discussed by Hollywood actress and former world champion kick-boxer and boxer Lucia Rijker who shared with the youth how commitment, dedication and determination had helped her achieve new heights in the fields of athletics and acting. 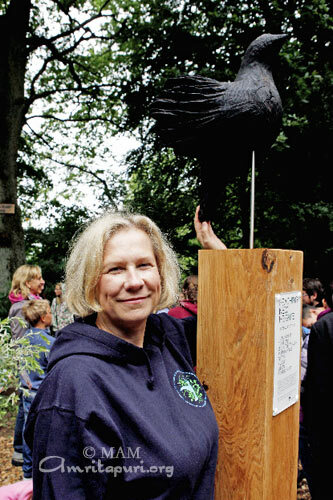 The power of creativity was discussed by the German artist Gabriele von Lutzau*, who emphasized the importance of creativity, originality and self-expression and suggested ways in which youth can uncap their own imaginative and innovative powers in order to bring change in their personal lives and the lives of others. In her talk she shared with the youth how she could turn scars into stars by using her art as a tool to come out of the traumatic experiences she had gone through. The power of community was discussed by Bri. Dipamrita Chaitanya who highlighted the importance of belonging to, and contributing to, a value based community in order to develop the character and value system of youth. 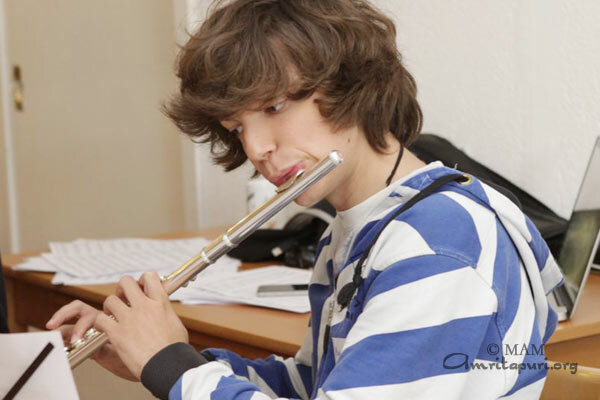 Making the initiative relevant to the youth themselves, the local community, and the wider society three large-scale projects were organised in close collaboration with the city of Michelstadt. 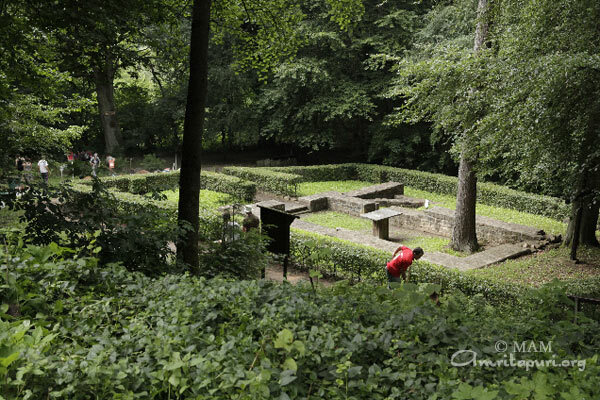 The first of these projects was the landscaping and garden project, which involved renovating and reshaping the park area of Heilig-Kreuz in Michelstadt, a town close by the M.A. Center Germany. Youth who participated in this workshop helped to re-design the area by plating greenery, repairing the broken bridge, cleaning the riverbeds and pathways and refurbishing the signs. 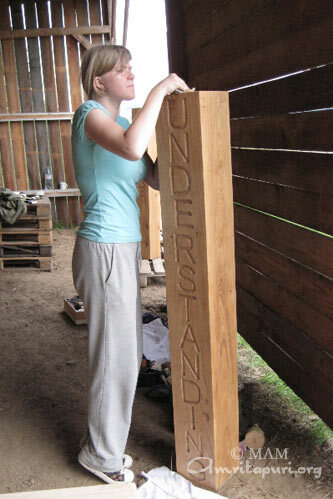 The second project was the creation of an artistic monument, lead by students from the woodcrafts school of Michelstadt. 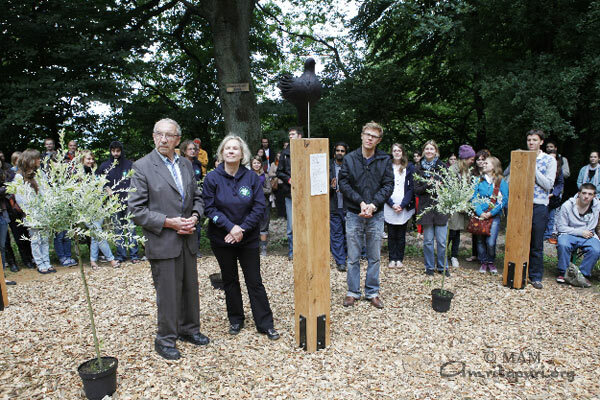 Participants designed a monument which was placed in the renovated park area at Heilig-Kreuz at the end of the camp. It stands as a symbol of the eight Youth Development Goals. The central pole of the monument carries a dove – universal symbol for peace and hope, made by Gabriele von Lutzau. 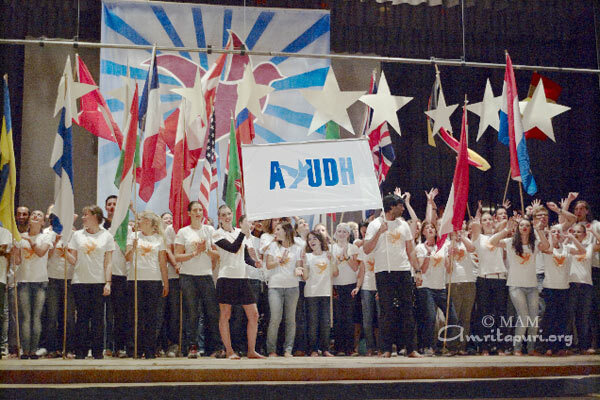 For six months the Ayudh groups from all over Europe had been writing songs, creating theatre scenes, dance choreographies and video documentaries which would exemplify the challenges they dealt with and show possible solutions to the audience. During the youth camp at M.A. Center Germany these individual scenes were put together into one performance. 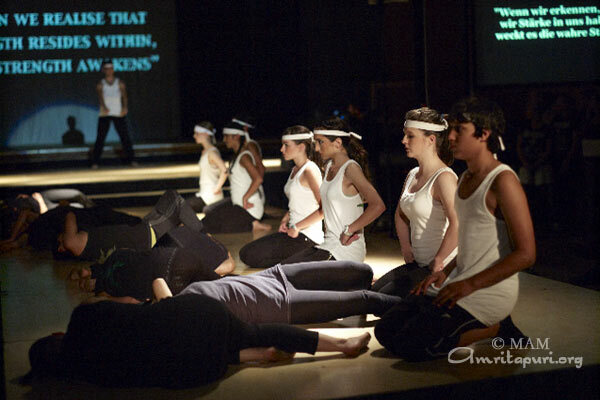 In workshops the youth took care of all aspects of the show: costumes, props, choir, stage construction, painting the backdrop, light, sound and video projection. Within just one week the youth created an amazing performance – a true example of the collective power of youth to inspire, create and reach new heights together. 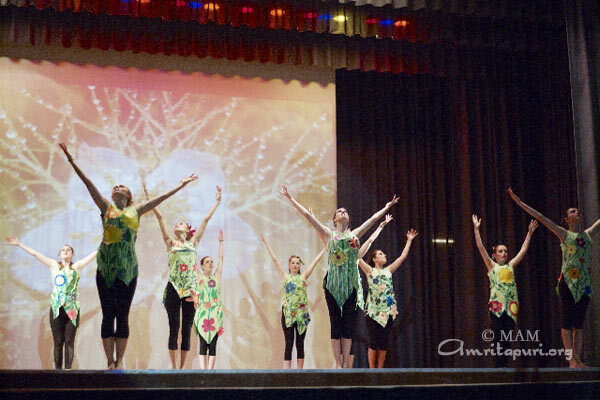 At the end of the performance, the hall echoed with the chants – “Mata Rani ki Jai”. Even with the intense activities during the week, the youngsters did not miss the chanting, meditation and yoga/tai chi sessions. Through the dedicated work of many volunteers and through the sincerity, joy and enthusiasm each person brought to the initiative, the 7th annual retreat was a complete success. 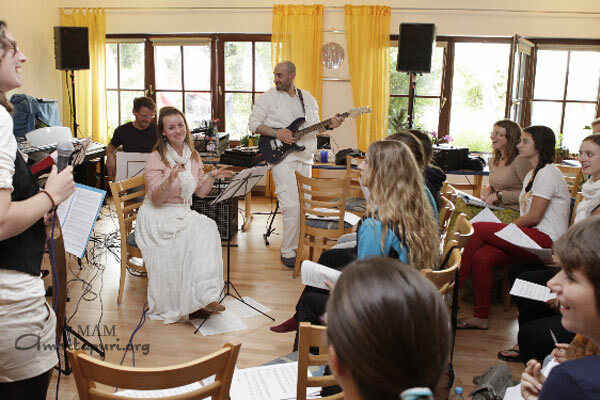 The event was supported by the “Youth in Action” programme of the European Commission for Education and Culture, the state of Hessen, the city of Michelstadt, the European Year of Volunteering, and the UN’s International Year of Youth. *Gabriele von Lutzau, who was also the patron of the initiative, had earned the “Bundesverdienstkreuz”, the German order of honor, for her outstanding role in rescuing passengers during the hijacking of a passenger aircraft by terrorists in 1977. As a stewardess on the kidnapped flight she had played a crucial role in the rescue operation and had shown enormous courage and compassion despite the life-threatening circumstances she was in.